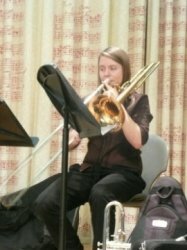 I am a trombonist and recent graduate from the Royal Academy of Music who has experience teaching young and old, beginners and advanced students. I am an enthusastic reliable musician and I'd be happy to teach and advice any espiring musician. I currently looking for All BRASS students and music theory students. I can also offer study help with GCSE and A level music. I have 8 years experience of teaching both privately and in schools. I have worked with a number of pupils through ABRSM grade examinations and had fantastic results as well as those who just wanted casual lessons!! If you'd like a reference, they are available on request. I have also have experience taking music classes/workshops and assembly concerts in schools and early years groups in and around London. I approach teaching very much pupil based. If you dont want to take exams thats fine! We'll just work through some music you like. I will make sure technique and sound production is improved and corrected where needed, I will also endeavour to make our lessons fun and you're practice as enjoyable as possible!